Here are a couple pictures of the area around where I live. 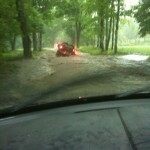 The picture with the truck is the road I took coming home Sunday afternoon. just about 20 minutes before this truck tried to drive through and you can see what happened. 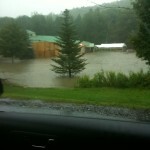 The other picture is the Long Trail Brewery about 2 miles from where I live. Where you see the water is where the parking lot is supposed to be. Click on the pics to enlarge them. I’ll post a pic soon of the Bridgewater Mill where we used to have the Bakery before moving to Hanover. You won’t believe what you see.